Youth choir information can be found in our Music section. Groups for babies, toddlers and primary school-aged children are detailed under Children’s activities. May-July 2019: Click on the latest term card of our main youth activities above. Some of our regular activities are listed below. Newcomers are always welcome. 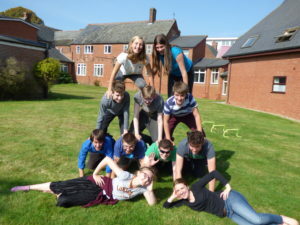 Meets as part of Junior Church on 2nd and 4th Sundays of the month at St Andrew’s Hall. We discuss life, Jesus and the Christian faith, and get to know one another better. Games and snacks often feature too! YO CFC is a youth group for 11 to 18s to meet together, socialise, grow in confidence and share ideas. 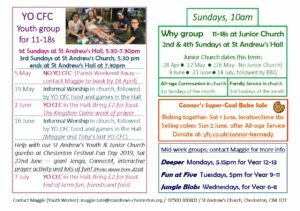 We meet at St Andrew’s Hall on 1st Sundays of the month from 5.30pm to 7.30pm, and on 3rd Sundays starting at St Andrew’s Church at 5.30pm and ending in the Hall at 7.30pm. We are a youth group for all young people in our local community, whatever your background or beliefs — if you are aged 11 to 18, come along and see! 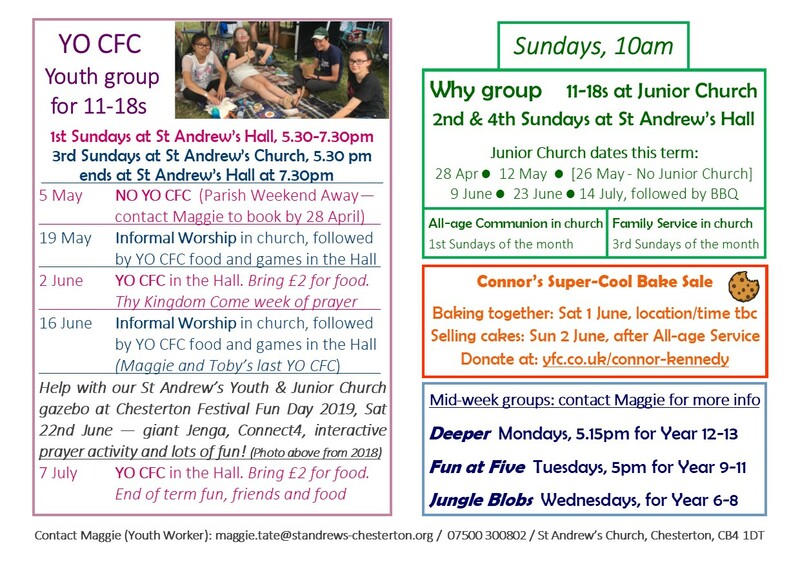 Check the dates in the term card above for when YO CFC is meeting this term. Please don’t hesitate to be in touch if you have any questions, large or small. Contact St Andrew’s Youth Worker, Maggie Tate. St Andrew’s has a Child Protection Policy which is actively applied and monitored. Our Safeguarding Co-ordinator is Linda Stollwerck Boulton. The Road UK – videos for young people to answer many of the big questions surrounding the Christian faith. Topics include the historical accuracy of Christianity, the Bible, Science and faith, Judgement and tolerance, the Church. Be thinking – aimed at 14-18s, to help you think through issues that may arise in the classroom or when talking with friends about Christianity. Bible in One Year – Soul Survivor Bible in One Year and New Testament in One Year, with videos to help you understand and apply God’s word each day.